To add an exercise to an existing Exercise Group select open the “MY Exercises” section. The open the exercise you want to add to an exercise group. From here you will the exercise widow displayed. Click on the “Exercise Groups” tab located towards the upper right side of the window. 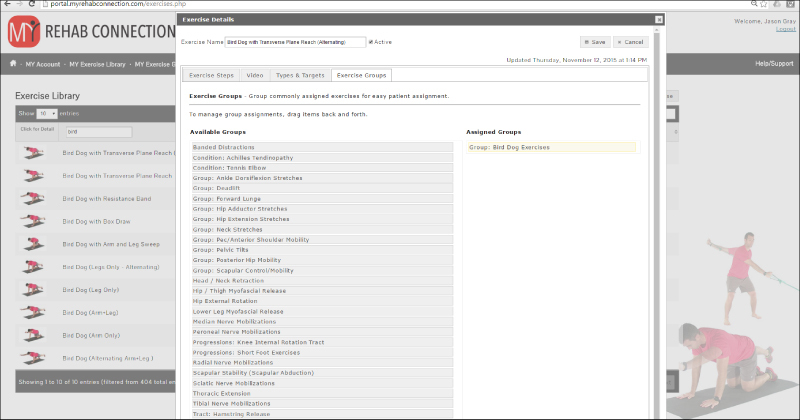 You will now see a list of available exercise groups on the left of the screen. These are the existing exercise groups that you can add your custom exercise(s) to. Note: You will only see the exercise groups you have created in this available exercise groups list as you cannot modify the pre-loaded exercises groups. To the right of the screen you will see a list of assigned groups. These are the current groups the exercise is assigned to. To add an exercise to an exercise group simply drag the exercise group from the ‘Available Groups’ column to the “Assigned Groups” column. To remove an exercise from an exercise group drag the exercise group from the “Assigned Groups” column to the “Available Groups” column.